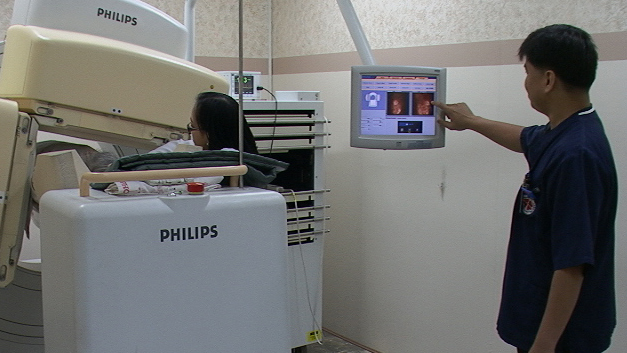 The Division of Nuclear Medicine of the Philippine Heart Center is a full service nuclear medicine which performs both diagnostic and therapeutic procedures. The division provides all the diagnostic procedures needed in a general Nuclear Medicine set-up with emphasis given to Cardiovascular Nuclear Medicine and radionuclide therapeutic procedures to treat diseases responsive to radioactive materials administered internally. It also provides in vitro procedures and interpretations. In the fight against disease, diagnosis is critical to the best treatment and outcome. Imaging techniques give the doctors and staff a unique way to look inside the human body. These techniques combine the use of state-of-the art sensitive scanning equipment, advanced computing technology and various radioactive substances to produce high quality images. Total number of procedures performed annually approximately 60,000. It is located at Pagbubungkos Plaza between hospital building and Medical Arts building. For more information please contact the local numbers 2164 to 2165.